AR Girls is a National Science Foundation funded research project designed to support teenage girls with an interest in art to develop science communication skills through interactive digital storytelling. MMSA held the first AR Girls Summer Intensive Camp August 6th – 17th at Waterfall Arts in Belfast, ME. 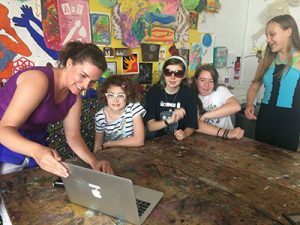 This camp is the first ever Augmented Reality (AR) camp in Maine with the underlying goal of supporting teen girls’ interest in science, as well as opening new pathways for their careers in science. The Summer Intensive Camp utilized the ARIS software to program and play the girls’ original AR Experiences. Augmented Reality is a contemporary mode of interactive storytelling in which a computer or mobile device is employed to blend real-life and digital content. A popular example of AR includes the Niantic mobile game Pokemon Go. ARIS is an internet-based software application that allows users to design digital stories that can then be played as AR games, virtual tours and/or other narrative structures, through an iOS App on a mobile device. Programming the AR stories in ARIS occurs through a graphic user interface, which means that users don’t have to know coding to do the programming, thus lowering the barriers to programming AR Experiences. Using a graphic user interface also allows learners to focus on designing stories, creating digital media to support their stories, as well as problem solving and other soft-skills, such as self-efficacy and teamwork. 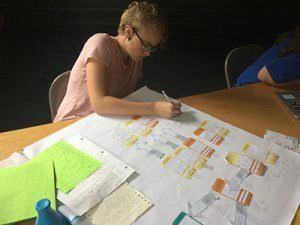 The two-week summer intensive was based on a backwards design model in which the girls began by playing AR experiences in ARIS, which were custom made teaching aids for this program. Once the girls experienced some of the possibilities that can be produced using ARIS, they created their own games. Eventually they were led back to the beginning of the design cycle, where they learned how to storyboard, design and plan to make digital stories in ARIS. After that introduction to ARIS and creating AR experiences, the girls met with “Community Partners,” who were science professionals, with areas of study ranging from geo-mapping to aquaculture to invertebrates. Each Community Partner shared a topic with the girls, based on the phenomena that they study. The girls broke into small groups and chose a topic, then proceeded to work with the science professionals to learn more about the topic and begin to co-design AR Experiences. The girls’ work throughout the remainder of the camp centered on practicing science communication as they designed and created their own AR tours and games, based on their work with the science professionals. The AR Experiences that the girls produced each tell a different and unique story, and were illustrated through original digital art. The girls created digital drawings using a software application called Sketchbook. Some created video interviews with other local professionals (including teachers and city employees,) which were edited in iMovie. Some teams also collected other forms of digital art, such as photos and infographics, to communicate the story about their science topics. As we cull and look through the data from the Summer Intensive Camp the reaction from the participants is full of positive reminders of how this type of work can influence girls in STEM. From broad statements like “programming ARIS is really fun,” to one camper’s realization that “I never knew that I had leadership skills before I participated in AR Girls.” The AR Girls work will continue into the school year with weekly meetings via phone or video conference and monthly in-person meetings through the end of the year. The fall component of the program allows the girls to meet and practice ways to deepen new skills and expand the connections they have made out into the world, as science and design professionals would do in their careers. AR Girls is currently recruiting 2 additional art organizations for 2019 for an expanded summer program. For more information contact Gemma Perretta Scott at gscott@mmsa.org. This project is funded by the National Science Foundation, grant #1657217. Any opinions, findings and conclusions or recommendations expressed in these materials are those of the author(s) and do not necessarily reflect the views of the National Science Foundation.